Although neither were major national stories, the success of both Pittsburgh and Navy were very surprising this season. Pitt won eight games in the first year of the Pat Narduzzi era, and stuck in the ACC Coastal race for much of the year. Meanwhile, Navy went 10-2, beating Memphis, and being in the American Athletic Conference race for a big chunk of the season. Now, both will hope to end their seasons on a high note in the Military Bowl. Just as surprising as the Panthers' overall success has been the fact they have done it without star running back James Conner. Conner tore his MCL early on and was expected to miss the entire year. Then, a rough year continued for him, as he was diagnosed with Hogkin's Lymphoma. The good news for both Conner and Pitt is that he has made his presence felt on the Panthers' sideline and helped the younger players. Running back Qadree Ollison has been a revelation in Conner's absence. He has 1,048 yards and 10 touchdowns on the year and while he doesn't have the pure power of Conner, he is excellent at finding holes on the defense. The passing game has also been solid, helped by senior Tyler Boyd, who has 873 yards on the campaign. Though, Navy has put out one of the nation's most underrated defenses, one that stifled a number of explosive AAC offenses. They should certainly be up for the task against Ollison, Boyd and more. On offense, Navy should be led by one of the best quarterbacks in college football history, one that has been criminally underrated. 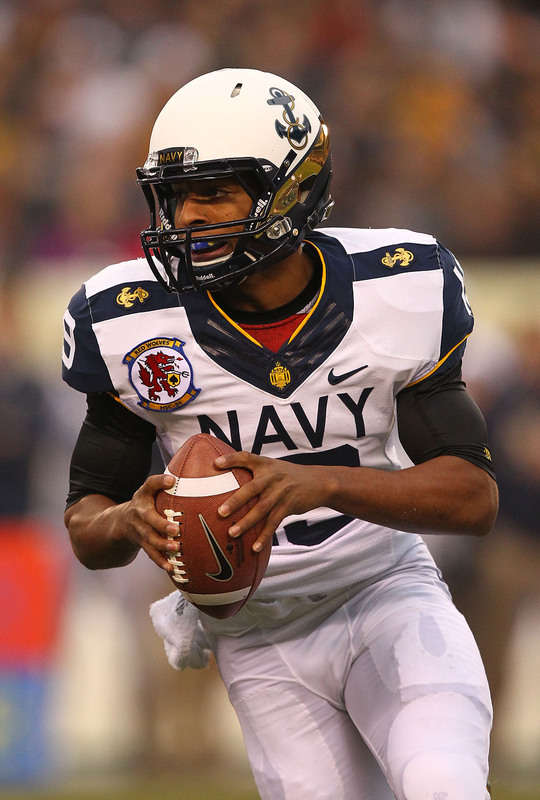 Senior Keenan Reynolds has run the Midshipmen's triple-option offense to near perfection throughout his time in Annapolis, but he was somehow not a Heisman finalist this year. Reynolds won't be asked to throw too much in Navy's offense but he has shown impressive accuracy. Though, his obvious strength is his speed, ball-carrying, and impressive awareness and feel of the game. Narduzzi led some great defenses when he was DC at Michigan State, so he will think of some creative schemes to tame Reynolds. The Midshipmen will also bring a number of other dangerous weapons in their backfield, including Chris Swain (909 yards, 10 scores) and bruising senior Quentin Ezell, who has six touchdowns on the season. This game could certainly turn into a nailbiter; both teams have similar strengths and both sides have plenty of motivation. Reynolds and Navy just might have a little bit more in the tank to get the job done. The MAC has had surprising success against the much, much more prestigious Big Ten over the past couple seasons, and they hope to claim yet another victim in this battle. Central Michigan, who finished off 7-5 overall and 6-2 in MAC play, will have a shot to take down the 5-7 Minnesota Golden Gophers, whose offensive struggles led them to a disappointing campaign. A popular Big Ten West pick, Minnesota desperately missed running back David Cobb and tight end Maxx Williams, contributing to an offense that was nearly completely devoid of big plays. Though, QB Mitch Leidner seemed to find his stride in the second half of the year, and back Shannon Brooks has an extremely bright future. Both will hope to put up big performances against a good, but not great CMU defense. On the other side of the ball, the Chippewas will lean heavily on the services of quarterback Cooper Rush. Rush is among the nation's most underrated quarterbacks in the entire nation, accounting for 3,703 yards and 25 touchdowns through the air, while also showing the ability to scramble. The Gophers' strength on defense is their secondary, headed by possible NFL defensive backs Breian Boddy-Calhoun and Eric Murray. That should set up for a very interesting match up against Rush, who has found success against some very stout secondaries. The Gophers' rush defense should be in good hands, particularly considering that Central Michigan's leading rusher is Martez Walker, with just 373 yards on the year. Minnesota has found all sorts of ways to lose bowl games over the years, but they should be completely expected to beat Central Michigan here. If they can, new head coach Tracy Claeys could do something his extremely popular predecessor Jerry Kill was never able to do. What a weird and interesting ride it has been for Cal football this season. The Golden Bears, who were starting to show significant progress last year under head coach Sonny Dykes, began the year 5-0 behind the huge arm of rising NFL prospect Jared Goff. But, the defense was atrocious in the year's second half, and Goff had his struggles contributing to five straight losses after that. The Bears would finish off 7-5, but rifts between Dykes and the athletic department continued to be distractions. Although there were rumors Dykes might leave, he ended up agreeing to an extension. Now, Cal will hope to end a weird season on a high note, against a solid Air Force team. The Bears will still certainly rely on the big arm of Goff, who still put up crazy numbers, with 4,252 yards and 37 touchdowns. Turnovers have been a problem (like his five interceptions against Utah) but Goff can still go off on any given night, which is obviously a worry for the Falcons. Air Force will also have to contain a number of playmakers at receiver, led by deep threat Bryce Treggs (813 yards, six touchdowns). While Cal moves the ball through the air in Dykes' air raid style, Air Force is completely the opposite. Their offense is all about their triple-option, which has been very productive all year long, and a major reason why they won the Mountain Division in the Mountain West. Senior Karson Roberts has been terrific all year long. He has shown modest numbers through the air, understandable in this offense, but is second on the team in rushing with 674 yards and nine scores. The team's leading rusher, explosive Jacobi Owens, should also be in full force in this one, after rushing for over 1,000 yards on the year. California's defense slumped unbelievably bad in the second half of the year. It has never been particularly strong under Dykes, as the Bears have won many shootouts. Though, the Air Force offense is much different than anything they faced in the Pac-12, which could be a good thing or a very, very bad thing. Cal has had a lot of time to prepare, so there aren't a ton of excuses if the play poorly in this game. I'm not overly confident, but the Bears' rush defense has been strong enough to make me believe they can win a close one. Entering the year, there were questions about the state of the North Carolina football program. Although the program had never been any comparison to the school's basketball, it had been solid under Butch Davis and early on under Larry Fedora. But, the Tar Heels were coming off a disappointing 6-7 year, highlighted by a terrible defense. After a tough loss to rival South Carolina, UNC instead went on a tear, winning 11 straight and earning a trip to the ACC Championship. Even though they were screwed late in the game on a offsides call, it was still impressive what UNC accomplished all year long and in the game. They hope to continue their success against a Baylor team that had their season ruined by injuries. After a flaming hot start led by QB Seth Russell, Baylor saw him go down with a season-ending injury. Then, they found success with true freshman quarterback Jarrett Stidham, only to see him go down. There was hope Stidham may be able to return for the bowl, but instead Art Briles will have to roll with his third-stringer Chris Johnson. Johnson will be without stud receiver Corey Coleman (who has played his last game at Baylor, after declaring for the 2016 NFL Draft) but will still at least have playmakers to help him. Johnny Jefferson and Devin Chafin can break open games at any moment, along with receivers K.D. Cannon and Jay Lee at receiver. And, while the 400-pound LaQuan McGowan may look comical at tight end, Briles did use him in their bowl loss a year ago. Though, the Tar Heels' defense has done a complete 180 from last season under former Auburn head coach Gene Chizik, their new defensive coordinator. Chizik has brought a disciplined defense to the table, one that can pressure the quarterback. Spencer Drango, Baylor's premier left tackle, along with the rest of the Bears' O-Line, with stopping the creative and deceptive blitzes Chizik comes up with. North Carolina has been potent at times offensively, led by senior QB Marquise Williams. Williams wasn't great in the ACC Championship game, but the veteran has a huge arm that has burned more than a few defenses. Baylor's secondary has been banged up as well, which only bodes worse for the Bears. The Bears will also have to stop rising sophomore Elijah Hood, who has been on fire at running back as of late for the Tar Heels. Ryan Switzer, a do-it-all receiver and specialist, is yet another playmaker they will have to counter. If Baylor was completely healthy, this one would be a heck of a game. It would be surely a shootout, and possibly an instant classic. But, it is hard for me to imagine Baylor winning with their third-stringer leading the offense, especially against a flaming UNC squad.